When Meredith and I were first hobnobbing around New York City’s health foods restaurants, black-bean – sweet-potato casserole was a popular offering: Lots of restaurants offered some version of it. The recipes often included these ingredients: blacked beans (overcooked), mashed sweet potato (high GI), a layer of cashews (high in saturated fat), ground flax seed (would be fine except that the casserole was baked – potentially turning the flax seed fat in AGEs), molasses (high GI) and moistened with olive oil and canola oil (both activate androgen activity – canola destabilizes my PSA). To the unknowledgeable, the black bean sweet potato casserole seems like a perfect combination of healthful foods. And given all its flaws, it is still light years healthier than standard western diet fare. But we’ve learned a lot since then. 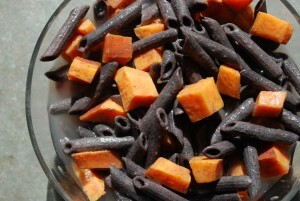 Feast your eyes on a CR Way Black Bean-Sweet Potato Pasta dish pictured above. Completely organic, easy to digest, non-GMO, nutrient-dense, low AGE, low GI, and deliciously al dente cooked sweet potatoes flavored – with ginger and fennel. Walnuts are the healthful fat source in the dish. This is a scrumptious, hearty meal that will give you enough calories for a breakfast, lunch or dinner, help keep your glucose under control, improve your lipid profile and provide a significant helping of nutrients. It is also easy to digest – eliminating some of the gas and allergic reactions that some beans can cause. Delicious breakthrough foods like this one are introduced in the CR Way to Great Glucose Control classes. Find out about this life-changing program: It can increase your chances to live better longer. Learn more about glucose control: Watch the free Better Glucose for a Better Life videos at LivingtheCRWay.com.